Omnicell - JWay Group Inc. Founded in 1992, this pioneer in automated dispensing systems offers advanced automation, data intelligence, and expert services for healthcare providers and pharmacies. 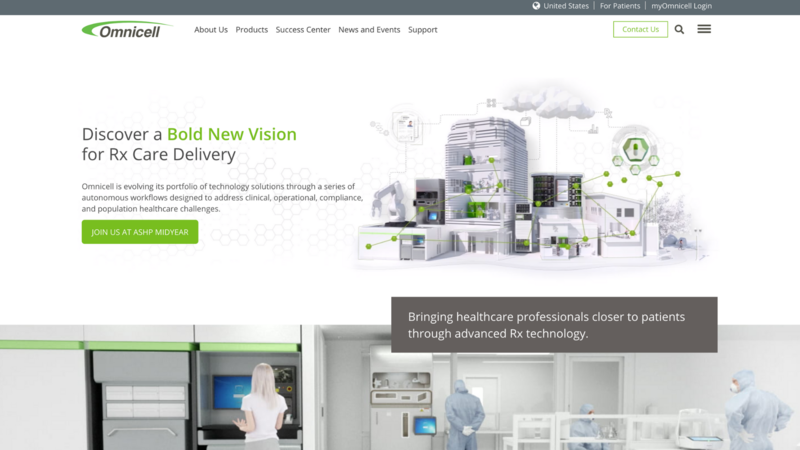 They needed a stronger branding presence and updated website to convey their presence as a global company in the healthcare-technology industry. They wanted to deliver improved patient safety, greater efficiency, lower costs, eliminate waste, ensure regulatory compliance, and address population health challenges. Healthcare facilities, retail and community pharmacies, closed-door pharmacies and healthcare providers who want to focus on patient care instead of administrative tasks. Develop a website based on a cloud infrastructure which allows greater digital connectivity across systems and eliminates manual, error-prone tasks with efficient processes and automated oversight. Requirements included a globalization and localization friendly design with a robust mega-menu. Engaging website with a robust, clean, easy to use interface that conveys its global image.